Under blue skies and a light breeze, the first of two stops in the Maritimes was last weekend’s Round 7 of the 2017 CMRC sanctioned Rockstar Energy Drink Motocross Nationals presented by Motovan at the Pleasant Valley Motorsport Park in Truro, Nova Scotia. The Pleasant Valley Motorsport Park has been back on the national schedule for the last two years and produced first time winners in both classes in 2017. The race track in Pleasant Valley is fast and technical, with off cambered corners and loamy soil that gets rough as the day progresses. The main racing line becomes slick as the day wears on, and riders must search for alternate lines. The starting area has a concrete pad that drops off into a long sweeping turn taking riders into a hollow. The start was modified this year, proved to be safer, and provided a much better flow. After admitting to struggling at the last two rounds, Nut Up Industries Kawasaki’s Dillan Epstein came into Round 7 with a “whole different mindset” and was the fastest qualifier during the morning’s practice sessions. Epstein then came out flying in Moto 1, and after getting a decent start made a few passes to get into the lead on Lap 5, posted the fastest lap of the moto, and was over 10 seconds clear of the field at the checkered flag. Dillan then came out in the second moto, this time was leading by the sixth lap. He posted the fastest lap of the moto again, and was perfect on route to sweeping both motos to earn his first overall win. Dillan is the first rider in the MX1 class to sweep both motos this season and now has four moto wins in 2017. Nut Up Industries Kawasaki’s Dillan Epstein came into Round 7 with a “whole different mindset” and went 1-1 for the win. Rockstar Energy OTSFF Yamaha’s Matt Goerke was sixth in qualifying and said he struggled in practice and couldn’t figure out how to ride this track. After narrowly missing a fallen Colton Facciotti at the beginning of the first moto, Goerke found himself outside the top 10 on the opening lap and rode much better, working his way up to third before the halfway point where he would finish Moto 1. Matt’s second moto start put him fifth after the opening lap and from there he was able to move up to second. He finished the day with 3-2 moto scores for second overall, and extended his points lead to 19 in the championship standings. After turning in another good qualifying performance that saw him post the second fastest lap time, Monster Energy Alpinestars Kawasaki’s Mike Alessi passed Keylan Meston, who had grabbed the Royal Distributing Holeshot, to take the lead on the opening lap of Moto 1. Alessi led the first four laps before being passed by Epstein and finished the first moto in second place. Mike pulled the holeshot in Moto 2 and ran up front for five laps before getting a flat front tire. He was forced to nurse his Kawasaki home to a seventh-place finish by moto’s end. Mike moved up one position after Christophe Pourcel was penalized in the second moto, and his 2-6 finishes put him on the podium in third overall for the day. Rockstar Energy OTSFF Yamaha’s Matt Goerke extended his points lead to 19 in the championship standings. Royal Distributing Motovan Piller’s Race Team’s Kyle Chisholm turned in his best performance of the season and was fourth overall on the day after finishing 7-3. Chisholm got by his teammate Tyler Medaglia in the second moto and was able to stay ahead of the local hero on route to his best moto finish in 2017. Living only minutes from the Pleasant Valley track, local hero Royal Distributing Motovan Piller’s Race Team’s Tyler Medaglia used his expierience on this race track to post the third fastest lap time in the morning’s qualifying sessions. Expectations were high for Medaglia coming into his hometown race this year after finishing on the podium there last season and having such a great 2017 campaign. Tyler’s starts were not great in either moto, and he scored 5-4 moto finishes putting him in fifth overall for the day. Rockstar Husqvarna’s Christophe Pourcel went down on the start of the first moto and charged back from last place to finish in fourth. Pourcel got a great start in the second moto and looked like his was going to finish in second before being passed late in the race by Goerke. Christophe crossed the finish line in third but was assessed a 5-position penalty for not showing up to the podium after the moto. He ended up sixth overall. After qualifying fifth, Honda Canada GDR Fox Racing’s Colton Facciotti had a violent looking crash early in the first moto and put in a gutsy performance to finish ninth. After getting a good jump out of the gate in Moto 2, Facciotti had more problems on the fourth lap and finished the moto in fifth. Colton’s 9-5 finishes put him seventh overall for the day. Rounding out the top 10 were Rockstar Energy OTSFF Yamaha’s Tim Tremblay in eighth, Motovan Piller’s Race Team’s Nathan Bles in ninth, and Red Line Powercraft Kawasaki’s Brock Leitner in tenth. Monster Energy Alpinestars Kawasaki’s Mike Alessi pulled the holeshot in Moto 2 and led for five laps before getting a flat front tire. Coming back three weeks after surgery to plate and screw his broken collarbone, MX101 FXR Yamaha Team’s Jess Pettis got to work immediately and was the second fastest qualifier. Pettis got a great start in the first moto and rode well to come home second at the checkered flag. Jess got another great start in Moto 2, and after being passed by Dylan Wright and then teammate Shawn Maffenbeier early in the race, benefitted after those two riders had problems and found himself in the lead on Lap 12. Jess hung on to get his first moto win and overall victory of his career, and was ecstatic on the podium at day’s end. Monster Energy Alpinestars Kawasaki’s Jacob Hayes was the fifth fastest qualifier in the MX2 class and turned a couple of good starts into 4-2 moto finishes, and was second overall for the day. Hayes benefitted from other riders’ misfortunes in the second moto to notch his best finish of the year, his career best in the Canadian Nationals, and was solid all day on a difficult, slick racetrack. After qualifying fourth in the morning, Honda Canada GDR Fox Racing’s Dylan Wright got a decent start in the first moto and made passes on rookie Tanner Ward and Jacob Hayes to finish the moto in third. Wright’s start was even better in Moto 2 when he found himself in second place by Lap 2, and was in a great battle for the lead with Josh Osby. With six laps remaining in Moto 2, Wright and Osby were bar to bar going over the high-speed finish line jump and collided sending Osby off the track into a violent crash that put him out of the race. Dylan led for another lap until going down in the soft dirt on the corner after the finish line and remounted to finish third. His 3-3 moto finishes earned him third overall on the day. Dylan has now finished on the podium in each of the last four rounds. MX101 FXR Yamaha Team’s Jess Pettis hung on to get his first moto win and overall victory of his career. Nut Up Industries Kawasaki’s Ryan Surratt didn’t get the good starts we have become used to seeing and was fourth overall with 7-4 moto finishes. KTM Rookie Pro-Am Rider Tanner Ward got his first taste of what it is like to lead a National after he holeshotted the first moto, led for a lap, and hung in there with the big guns to finish the moto in fifth. Ward got a poor start in Moto 2 but was able to move forward. The rookie finished the moto in sixth putting him fifth overall for the day, his best finish in the Pro class this season. MX101 FXR Yamaha Team’s Shawn Maffenbeier came into Round 7 two points back of series leader Cole Thompson, and will now go into Round 8 with the red plate and leading the series by 21 points. Maffenbeier qualified first, led all but one lap of Moto 1, and posted the fastest lap of the race. Shawn was running in the top 5 of the second moto when his bike stalled on the fifth lap. He could not restart it until he unplugged a heat sensor and finished the moto twenty-fourth. He still managed to post the fastest lap of Moto 2, and ended the day eighth overall. Monster Energy Alpinestars Kawasaki’s Jacob Hayes was solid all day on a difficult, slick racetrack. After going out in practice and completing only one lap, KTM Canada Thor Racing’s Cole Thompson called it quits for the season. After the race, Thompson announced that he will have surgery to fix the ligaments in his thumb that he injured during Round 6. Up until last weekend, Thompson was having another great season and was in a good position to repeat as MX2 Champion in 2017. Redemption Racing KTM’s Josh Osby came into Round 7 only nine points back of the series lead and had a lot of momentum after earning his first moto win of his career at Round 6. Osby qualified third and struggled to finish eighth in the first moto. After grabbing the holeshot in Moto 2, Josh led for 10 laps before colliding with Wright over the finish line jump and going down hard in a violent crash that forced him to be taken to a local hospital where he was diagnosed with a lacerated liver. Honda Canada GDR Fox Racing’s Dylan Wright 3-3 moto finishes earned him third overall on the day. 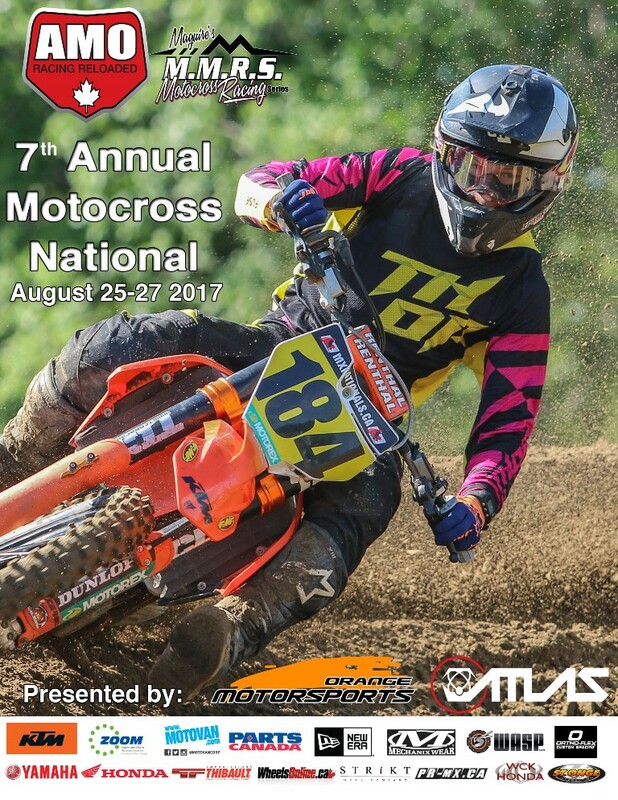 Next weekend the series moves to Moncton, New Brunswick as Round 8 of the CMRC sanctioned Rockstar Energy Drink Motocross Nationals presented by Motovan will take place next Sunday, July 30th at the Riverglade MX Park. If you haven’t already purchased your tickets you can buy them online easily at www.mxnationals.ca/tickets. If you are in another part of the country and are unable to attend the race, you can see all the action live by downloading the free Conx2share app or logging on to www.conx2share.com and live stream every moto on either your mobile phone or computer.